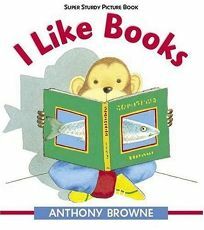 Anthony Browne's 1989 I Like Books makes an ideal convert to the sturdy series as the monkey star enumerates all the books he enjoys. PW called it ""positive and upbeat sends a clear message, encouraging the overlapping events of imaginative play, real activities and reading."" (Aug.) .